Benzimidazole susceptible worms of the following species in cattle. 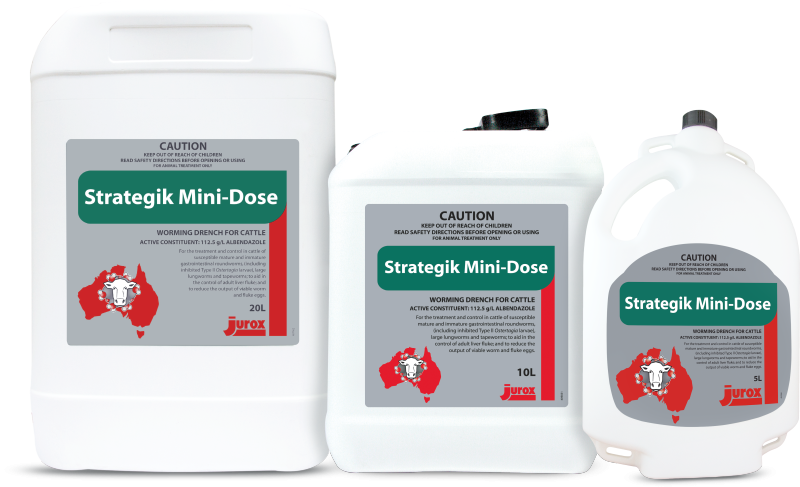 Strategik is ovicidal and therefore reduces the output of viable worm and fluke eggs. Meat: DO NOT ADMINISTER less than 10 days before slaughter for human consumption. Milk: DO NOT ADMINISTER to cattle producing milk for human consumption. DO NOT USE less than 10 days before slaughter for export. Dose rate should be based on the heaviest cattle in the mob. Cattle should be weighed either with scales or a weighband. Refer to Dose Volume table on product label. A second treatment one month after the first will help prevent contamination of pastures and will minimise chances of re-infestation. To gain maximum benefit from the reduction in the output of viable worm and fluke eggs, avoid placing treated stock on clean pastures for a minimum of four hours after dosing.